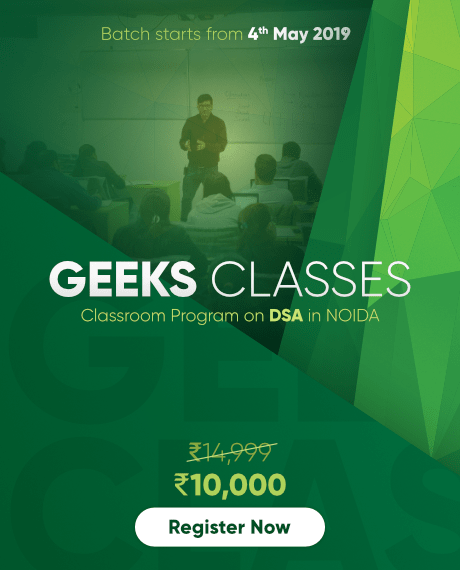 Association is relation between two separate classes which establishes through their Objects. Association can be one-to-one, one-to-many, many-to-one, many-to-many. 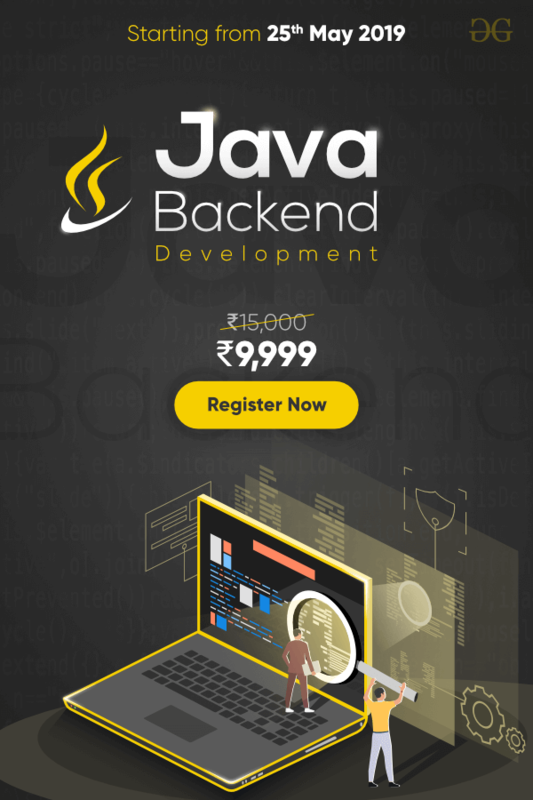 In Object-Oriented programming, an Object communicates to other Object to use functionality and services provided by that object. Composition and Aggregation are the two forms of association. 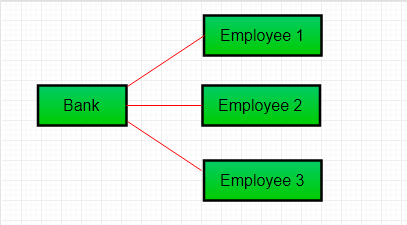 In above example two separate classes Bank and Employee are associated through their Objects. Bank can have many employees, So it is a one-to-many relationship. It is a unidirectional association i.e. a one way relationship. For example, department can have students but vice versa is not possible and thus unidirectional in nature. // creating an instance of Institute. In this example, there is an Institute which has no. of departments like CSE, EE. Every department has no. of students. So, we make a Institute class which has a reference to Object or no. of Objects (i.e. List of Objects) of the Department class. 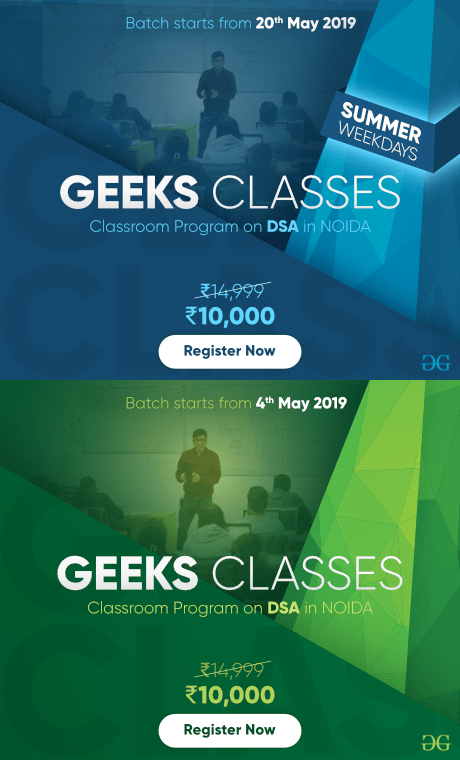 That means Institute class is associated with Department class through its Object(s). And Department class has also a reference to Object or Objects (i.e. List of Objects) of Student class means it is associated with Student class through its Object(s). It represents a Has-A relationship. When do we use Aggregation ?? Code reuse is best achieved by aggregation. Composition is a restricted form of Aggregation in which two entities are highly dependent on each other. In composition, both the entities are dependent on each other. When there is a composition between two entities, the composed object cannot exist without the other entity. Lets take example of Library. // reference to refer to list of books. // Creating the Objects of Book class. System.out.println("Title : " + bk.title + " and "
In above example a library can have no. of books on same or different subjects. So, If Library gets destroyed then All books within that particular library will be destroyed. i.e. book can not exist without library. That’s why it is composition. 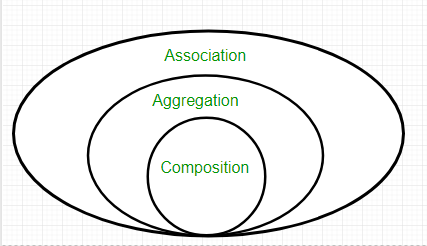 Type of Relationship: Aggregation relation is “has-a” and composition is “part-of” relation. Type of association: Composition is a strong Association whereas Aggregation is a weak Association. // it need to have a engine. // an instance of Engine class. // Making a car with engine. // creating instace of Car. In case of aggregation, the Car also performs its functions through an Engine. but the Engine is not always an internal part of the Car. An engine can be swapped out or even can be removed from the car. That’ why we make The Engine type field non-final.